1st Residence is a residential housing area developed by Mansion Builders Sdn. Bhd., a company established back in year 2001 that has been known throughout the years to have successfully answered the property market’s demands by building one after another high quality/creative commercial and residential properties. Therefore, it is no surprise that 1st Residence won the 2012 CIDB (Construction Industry Development Board) awards as well as being “the best value for money in terms of affordable housing in Perak” as stated by Ir. Loh Ban Ho, Director of Mansion Builders. Still considered as some of the more newly developed household, 1st Residence does not employ any system previously within its neighbourhood and thus needed a solution that could help out in its communication aspect since this has always been their main concern. When engaged with our Perak reseller, KBB Business Solutions Sdn. Bhd., the management found that i-Neighbour is more than capable of improving their communication & visitor management system because of how the solution incorporates various features such as In-App Intercom, E-Info and etc. Hence, the decision was made to deploy our solution. 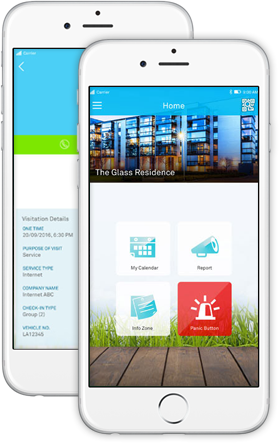 i-Neighbour is a Smart Community System that integrates Visitor Management System and Residential Management System all in one cloud platform. With i-Neighbour, residents will be informed of the latest update from the management office without having to inconveniently take a stroll towards the physical bulletin board and can even depend on i-Neighbour as their ‘one-stop info zone’ towards various shared important contacts all via its E-Info feature. On the other hand, communication between the security side of the neighbourhood will also be reinforced as the In-App Intercom feature of i-Neighbour allows security guards to keep in touch with the residents involved during the visitation process and prevent any unauthorized individuals from entering the neighbourhood. Now with a subscription of over 100 units being utilized within both of the residence neighbourhood: Taman Tawas Jaya and Klebang Restu, 1st Residence is among one of the first community to experience i-Neighbour in the state of Perak. Through our mature and stable system, 1st Residence can definitely expect their quality of living to improve significantly and be able to usher into the lifestyle of a Smart Community in the years to come.